Error: Can't Access My Website. PAID! This is an URGENT request for help! As in years past... I made my payment. 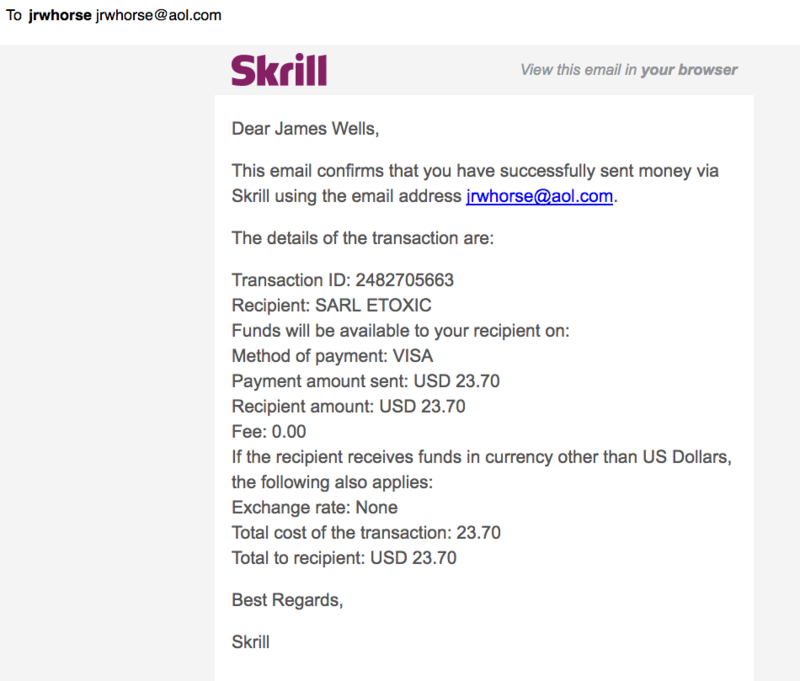 Skrill processed my order and the PAID receipt is attached and posted below. Now I can't access my website. ERROR warning below. The Error says: (This domain has expired and is pending renewal or deletion.) Note PAID receipt above. My payment was accepted, processed and I was sent a confirming e-mail. 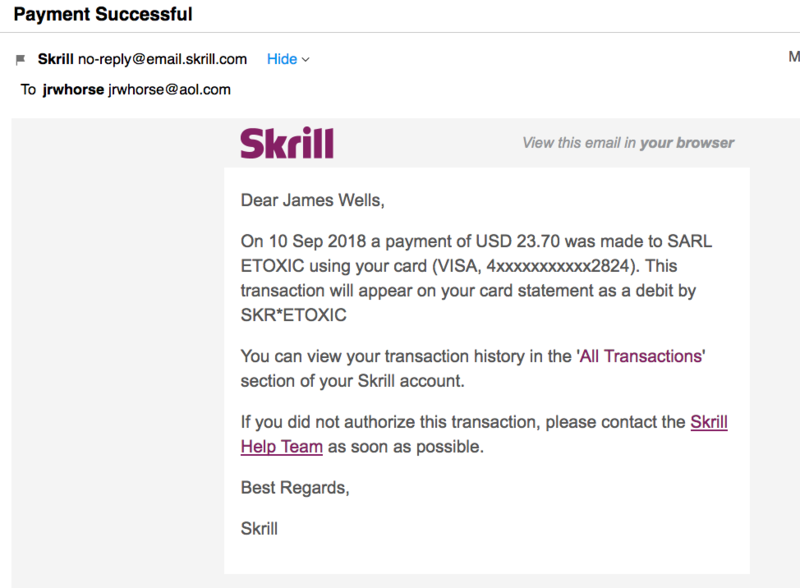 Skrill noted my payment and website and Domain Name would be up in 20 minutes as of yesterday morning (9/10/18) at 10 am EST. One day later (9/11/18), today at 7:30 AM EST, I can't get to my website because of the ERROR. I can't afford to lose this website! I did my job and made my payment. Please contact me by e-mail when this ERROR is resolved and my Domain name is working. I've been a forumotion member and user for several years and never had a problem like this. I have several website updates that must be made ASAP! Re: Error: Can't Access My Website. PAID! Hello! I do apologize that you are having issues with your domain name currently and I can certainly understand your frustration. If the custom domain isn't working, you may need to access your forum by the original domain name created by Forumotion and just re-add that custom domain in your Administration Panel. If correct, your old website URL should be http://sof-bf4.forumotion.com/. Can you try logging into that and see if you can add the domain back like you did originally in the past and see if that works? Also, I would suggest removing your personal information such as your name and email from your post as this is personal information and the staff will likely remove it as well. Just wanted to give you a heads up! For assistance with the domain name in your Admin Panel, here are 2 helpful topics you can read from the official staff of Forumotion! Please read the answer above and see if it helps. Also, you need to understand that it takes up to 24 to 72h to renew your domain name. The page that it's showing up will disappear as soon as our tech team accepts your payment (as it's done manually). Can I ask you one thing do you have at least one of the following packages ? if No then you can not renew your domain name without one of them. Good day and thanks for the quick replies. You folks have always been good to me in the past. I am the Full Owner and Master Admin of my forum. I have a Free forum and use "Advanced"
To address the 72 hour time limit, for my website to be up and working again... I will wait until Friday morning, 9/14/18 to test my website again. If the same ERROR occurs... I will be back on here. Although I've never had this issue before. Last year, when I renewed my Domain Name for my forumotion website... I had no interruptions or service access problems. My members and myself enjoy using and working with our website each day. brings me back to the ERROR page I stated and had a link to in my first post. So I can NOT get to anything concerning my website, Free or Paid. I simply have NO access either way. Hopefully this will be resolved by Friday morning. I will let you all know if my issue gets resolved and I have access to my website again. Losing this website would be devastating to my members and throw years of work down the drain for me. When you say you use "Advanced" are you referring to "Advanced" view in the Admin Panel or did you purchase the Advanced Package that Forumotion recently came out with? For more information on Forumotion Packages, please checkout the link below! What @APE meant is that you need to purchase the Advanced Package or Premium Package to be allowed to have a custom domain, if you do not have this package you will not be able to use a custom domain unless I am mistaken. If you are using a domain name outside of Forumotion you need to have at least a package on your forum. when I say advanced package I mean the new payment plan we have on our systems now. you can no longer have a custom domain outside of Forumotion without one of the forums packages hosted by us. @APE wrote: If you are using a domain name outside of Forumotion you need to have at least a package on your forum. "when I say advanced package I mean the new payment plan we have on our systems now.."
Is this a new requirement? As in years past... I operate a free forumotion web forum... and in the past, each year I've paid for the option of having a personal web address for my forum... and now I have to pay extra again, for the privilege to have this personal web address? This was not a problem for me until now, since I've chosen forumotion as a web forum some time ago. How much "extra" cost, will I incur for this new "Advanced Package" to keep my website up and running? I am a volunteer for our web information forum club. I don't charge dues to my members to be part of the group. They would not pay dues anyway. They would just move to a different forum. So I incur all the costs to keep the forum website up and running as well as all the work involved in how it works and looks. I received my yearly forumotion e-mail, telling me I had to 'renew' my domain name to keep my unique web address... paid the fee... and now I have to pay more for a new "Advanced Package", just to use my unique web address?? So you've got my money for my personal web address as per your e-mail request notice... and now, I have no forum website anymore... and now I need to pay extra to get it back up and running as it was last year? Once I know what the 'extra' cost of this "Advanced Package" will cost me... I will have to decide if using forumotion for my member forum is in my best interest anymore. Note: You folks use this "Credits" system for pricing. I don't understand why. I need to know the price in U.S. Dollars so I can make my decision if I will continue with forumotion. Since I can't get on my website now... I can't seem to find that price in dollars. I don't live on your forumotion website here... so I have no knowledge of this new requirement. In my forum management area, where I manage my site... I don't remember seeing a notice about buying or renting each year a new "Advanced Package" just to keep my web address. Please let me know what this is going to cost me. I will also look here on your website for that information. In the meantime... I'll have to somehow contact my over 100+ membership... that they might not have a forum website for awhile. I hope my membership doesn't leave me over this. Forum members don't like waiting over glitches to get back on their Forums to interact with their friends! In years past... through GoDaddy, I paid for a unique address and paid "A Lot" for a Forum software system and website server space... and just about when broke. That's why we moved our online Forum to forumotion. So it is a new thing that was announced back in April of this year. For the Advanced package, it will cost about $45 for the 3,600 credits in USD to purchase the Advanced Package! All Admin control panels have had the information posted on them for a long time now I think it was back in April. 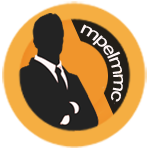 It is down to you the founder of the forum to keep an eye on your ACP to see updates that may be online at the time. The cost was always paid for by the ad's on your forum and the price of domain names and other paid for things on our forums but as the price and cost has gone up we had NO choice but to bring this in like all other Free hosted forums and websites. I am finally able to get back on my website with your forumotion.com address: http://sof-bf4.forumotion.com/forum. This just started working this morning. At least I have access to my information again. Of course... my current membership can't find the old website under the www.sof-bf4.net. I will reluctantly pay your $45 dollars for your new "Advanced Package" option. NOTE: I have already PAID for my unique website address, so I expect my old web domain name back to: www.sof-bf4.net, as it has been for several years, see my PAID Receipt provided here in this thread by (Skrill). I have some decisions to make over the next few months. When I pay for your "Advanced Package", I want to see my forum website Domain Name restored. I won't pay a second time for that Domain Name that I've been using. If buying the Advanced Package also requires me to (RE-Purchase) the Domain Name option... I will expect a total refund of both the Advanced Package cost and the Domain Name cost. I will revisit the forum here over the next several days, if I have any issues or problems that need resolved. To do this, you will first need to acquire a package (advanced or premium) allowing you to use a domain name (I recommend an annual activation of your package to benefit from your package immediately and without any waiting). Once your package is activated, you must renew your domain name and everything will be in order. the forum will respond again on its personalized domain name as soon as it is reactivated. You should have increased the cost of the unique Domain Name option ONLY... even double the cost of the Domain Name option... but still provided it with the FREE FORUM option. Requiring your customers to purchase BOTH the "Advanced Package", just to keep their unique Domain Name... does not look good in the eyes of your customers. Now your "Advanced Package" customers... are required to subsidize your FREE forum users, that chose not to use a unique Domain Name. You could call this "Unique Domain Name" welfare. If you need more money to provide a unique Domain Name... increase that cost. IF you need money for your "FREE" Forum package... then charge for the Forum Software and no longer call it FREE. Hiding a new charge or cost of your Forum software but calling it an: Advanced Package option, your Forum Software, is no longer FREE for your customers requiring a Unique Domain Name. NOTE: I renewed my unique Domain Name on September 10th, 2018... as I believe my PAID receipt indicates. So I was within your expiration date by 2 days. If you need to see the receipt again... I will provide another copy. we will not discuss or debate again our decision as to why and how to introduce packages on Forumotion. I invite you to read this topic which deals in detail with this question explaining the ins and outs of the thing. As for the payment you are referring to, it's a simple purchase of credits that you made on September 10, 2018 for the purchase of 2000 credits that you obtained on your forum on the same day and that are still there. I purchased the forumotion "Advanced Package" that includes the unique domain name option. The "Summary & Management" area of my forum website says: "Currently, your forum address is http://sof-bf4.net"
So my unique domain name is still not working or activated... as the "Advanced Package" states it should be. It's now been over 24 hours. Can you please fix this? I don't want the :http://sof-bf4.forumotion.com address. Yes, did you renew the domain name after purchasing the package? I see by the post before you are hosting your forum Domain name with Godaddy is that right ? If yes then your domain name is not set up right with them.